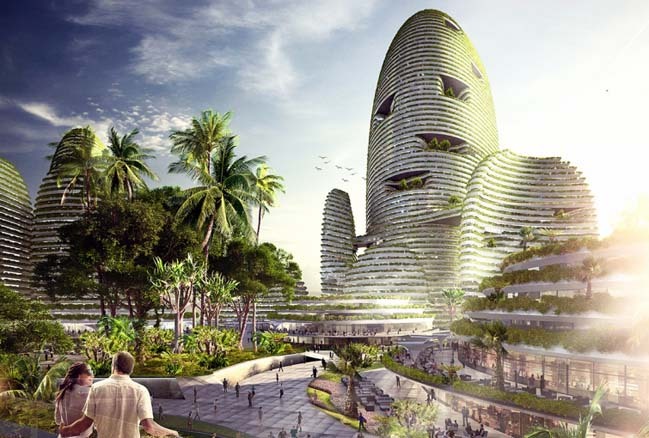 Forest City is a great architectural concept by LAVA that has got 2nd prize in an international competition to design a new city in Malaysia. 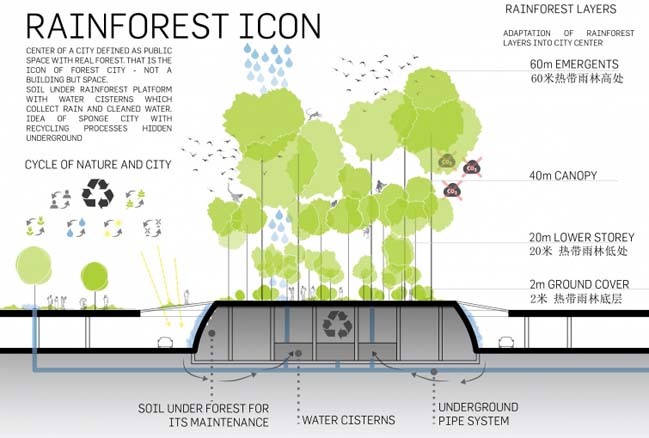 From the architects: LAVA’s concept sees the city defined not as one iconic building, nor as a skyline, but as a central public space, a real forest. 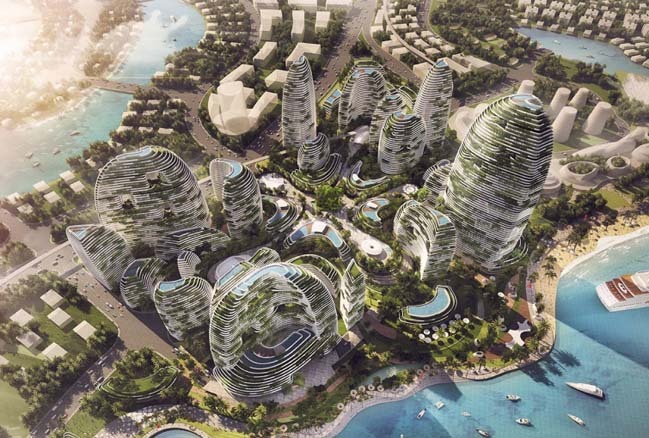 Forest City, by Chinese developer Country Garden, is a new 20 square kilometre green smart city in southern Malaysia. 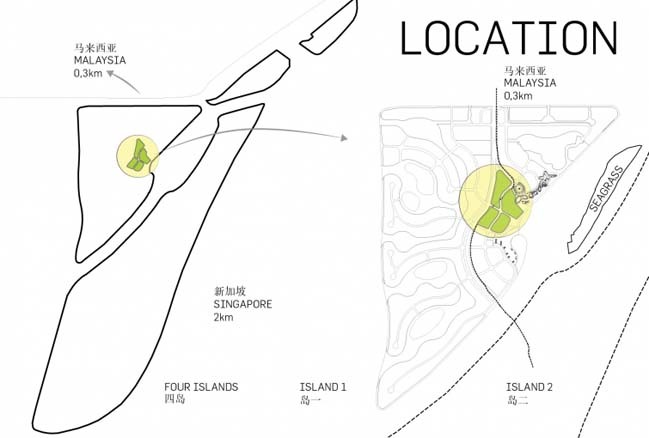 Located on reclaimed land between Malaysia and Singapore, it will house 700,000 people with office towers, parks, hotels, shopping malls and an international school. 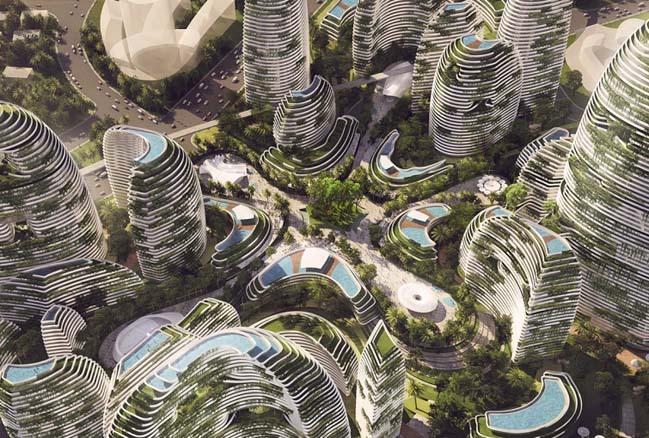 The competition for a 24-hectare site within the development sought designs that improve the efficiency of land use, enhance the quality of space and environment, and include a landmark building embodying the notion of a forest city. 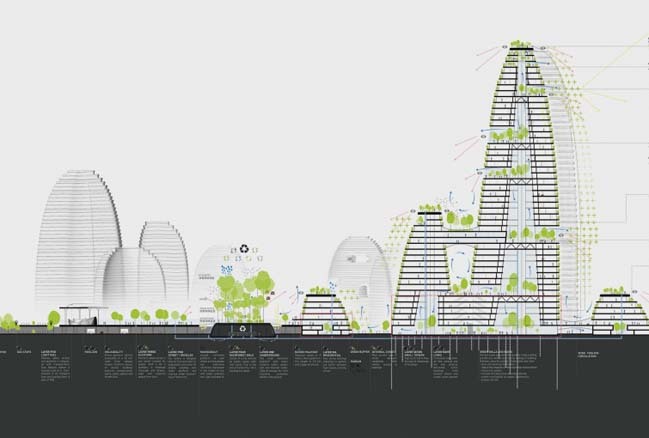 Future city notions are embedded into LAVA’s overall concept – a ‘public city’, a central public space surrounded by buildings; a ‘layered city’, where people, railways and traffic are separated with vehicles underground; a ‘loop city’, a closed loop system reusing it’s resources and controlling the out-flow; and a ‘sponge city’, with recycling processes hidden underground. Nature is the inspiration with sustainable local materials, renewable energy sources and local social development. 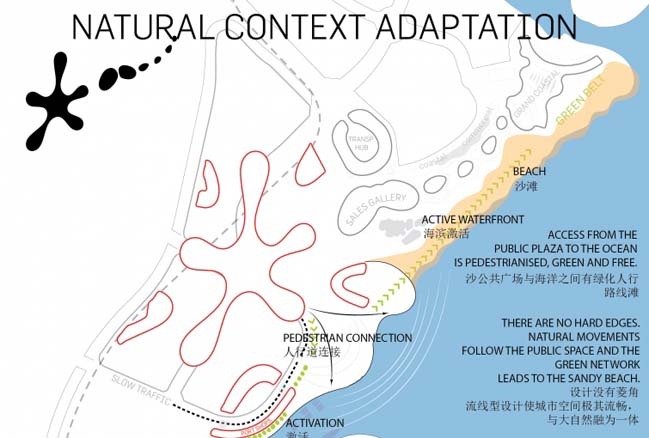 The central public space, the Rainforest Valley, has five iconic quarters, five fingers, representing the five elements of Chinese Taoist cosmology: wood, fire, earth, metal and water. 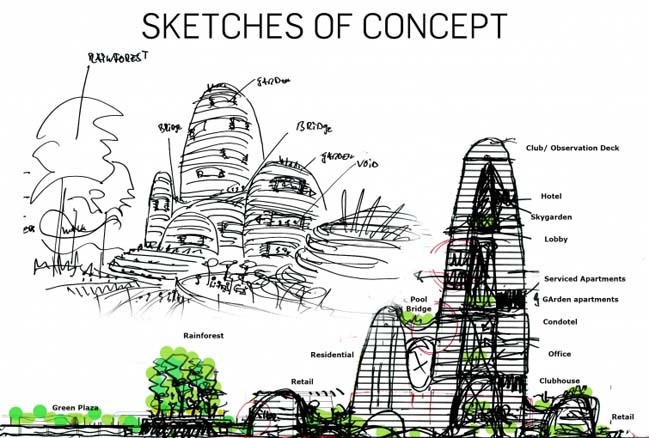 They also represent the five pillars of a sustainable city: economic, environmental, social, cultural, equity, with a community pavilion dedicated to each element. The valley is a layered space. In the middle a rainforest emerges and rises into the sky and is surrounded by a waterfall, which fills with water after each rainfall. 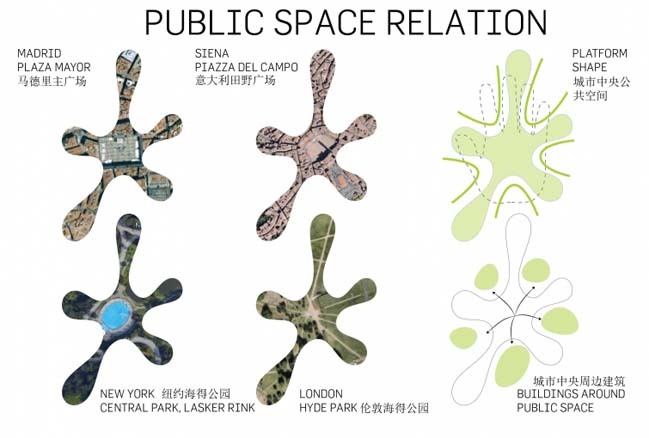 It's a visual reminder of the city as a three-dimensional ecosystem, a habitat, a green-layered system of networks and relationships of nature. 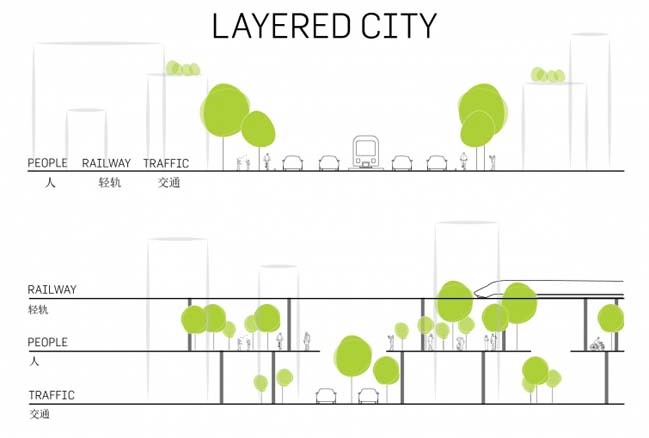 The valley visually and physically connects the undercroft (and infrastructure) with the pedestrian level and provides light and air circulation. 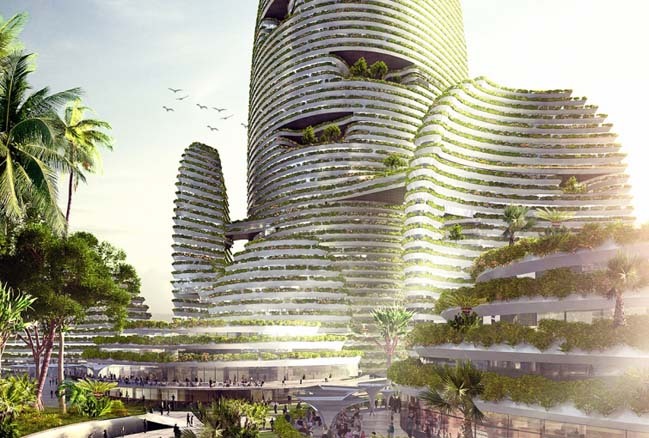 A group of buildings step down towards this green public centre and are an architectural interpretation of the rainforest, with various layers of program and vertical stratification. Each of them is an independent unit but interacting in symbiosis, each connecting and supporting each other. A Landmark Tower consists of serviced apartments, hotels, retail and commercial space. 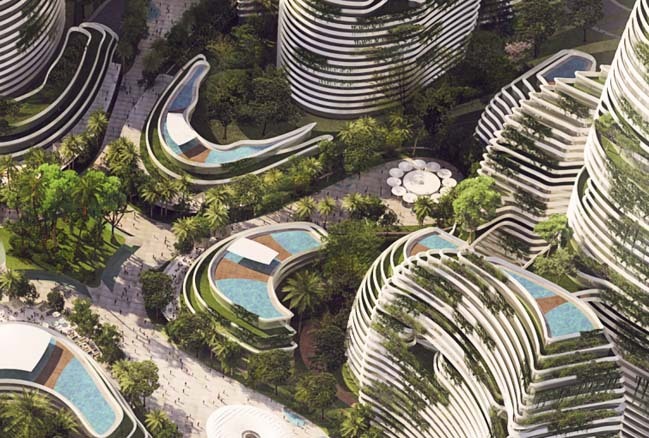 The floor plans are modular, efficient, easy to construct and cost-effective, with large internal and external roof gardens and terraces to decrease building temperatures. In contrast with traditional, centralised masterplan layouts, all the apartments enjoy great views. 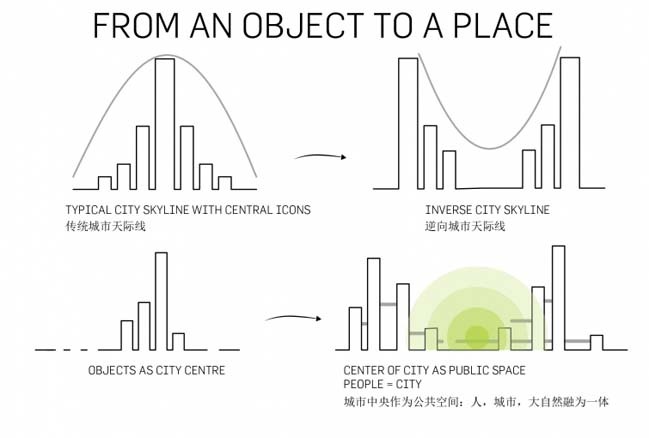 Bosse added: ‘We were able to draw upon the research and strategies from our competition-winning entry for the design of Masdar city centre - 24/7 activation, performance and interaction. 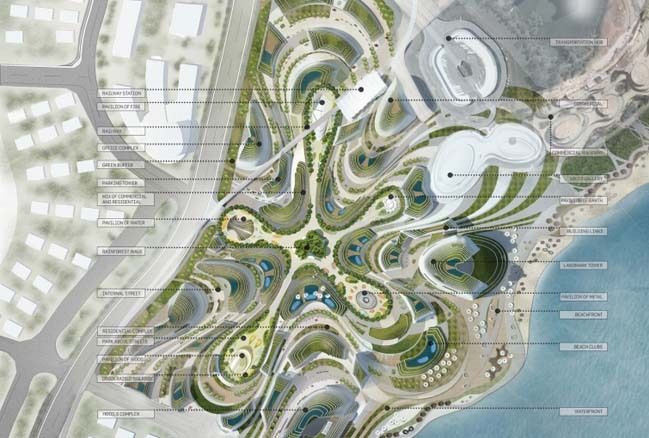 The international design competition for the mixed-use green development attracted over 500 international entries with the twin themes of ‘integrating businesses and the city’ as well as ‘urban innovation’.